The Best is now even better. How is it so? Well, I know this is my personal opinion only, but Nokia Sports Tracker is my favorite S60 application and I see its functionality as the most enjoyable feature added to a mobile phone. If you don’t know this application simply install it and use it. You will know what I mean. For current users there is good information, which you could discover by yourself, last weekend. If you have turned on feature of automatic updated checking you might upgrade from version 1.76 or 1.82 to official 2.05. This version was officially released with Bluetooth Polar training accessories, but now can be installed on other devices as well. New NST 2.05 officially supports displaying maps in a background too. I hope it free of known problem with move measuring freeze. I know that a lot of users, including me, waits for information if heart rate meter will be compatible with E71 and other S60 phones. It seems that NST team is very busy, as the official application site still offers version 1.78 only. Anyway even if you will install older release, you should be able to update later to 2.05 directly from your phone. I have updated both my phones E71 and N96, unfortunately I didn’t get the update on my Mom’s N80. Let’s hope older phones (S60 3.0) will be supported too. Moreover a few days earlier Google also released version 3.0.0.1 of their Maps for S60 application, which now incorporates service called Latitude. It allows your friends from Google contact list to see your location. The application is available from your mobile at m.google.com Cool, but be careful, especially if you have your boss on your list 😉 My first observation is, that while leaving the app, it asks you, if you want to continue showing your position to your friends. It’s quite misleading and it leads you to not to close Maps completely. All Nokia users interested in checking full version of Nokia Maps application can now receive a trial license valid for a week! The application and form for ordering promo license code is available at http://maps.nokia.com. Two days ago I read a great post at E71fanatics.com blog analyzing how much data the use of A-GPS with Nokia E71 is consuming. Honesty speaking I was thinking about a similar post recently. Some time ago I was also afraid about the amount of data transferred when the phone is communicating with base stations to accelerate fixing my GPS position. As we all now know from the mentioned post, it is not so bad. But what if you don’t have a flat data rate, or you have only a small data package available, like 50 megabytes monthly? If you start A-GPS (for example by using application like Nokia Maps) it will consume less than 10 kilobytes and your phone will finish packet data connection. Nevertheless, you will pay for a whole data billing unit, which could be 50, 100 or even 500 kilobytes, depending on your operator rates. How to avoid it? The solution is really, really simple. After waking up (YES, I turn off my phone when I sleep, weird isn’t it?) I simply start native Nokia web browser (by long pressing 0 key) and I connect to GPRS/EDGE or 3G data domain using standard GPRS access point (called APN, in my case it is ‘Era Internet’). When I finish morning browsing, I simply hide browser by pressing Home key. What happens? The connection is maintained, but almost no transmission is done, because a web page is already fully loaded. Now let’s imagine you want to check your e-mail account, or use Nokia Maps (which is using A-GPS). When the chosen application starts, it asks you to choose an APN to be used for this software. Now choose the same, which was used for the native browser. What will happen? Data session opened for the browser will be activated, but within the same billing unit. Leave the application, leaving browser still working in a background and voila! You have found a very saving way to use data transmission. My experience shows that doing it in such a way I can check my email several times during a day, plus use A-GPS, browser, or IMs and all those actions could be done without exceeding 500 kilobytes. Now an obvious question may come to your mind. Does it have impact on battery uptime? The answer is yes, but very moderate. In comparison, this effect is much smaller than in case of push mail application using packet transmission more often. Of course if you use a flat rate it does not make sense to act this way, but for more economic usage of data transmission, Symbian S60 proves to have a really good, helpful connection manager. I’m very curious if you have any other way to save your phone bill? Nokia viNe: The Next Generation of Sports Tracker? 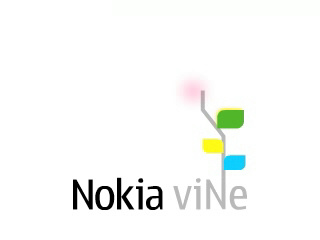 Finally Nokia viNe is officially released for selected N-series and E-series devices. Actually at the moment the only E-series device officially supporting viNe is Nokia E71. If you haven’t heard anything about the viNe before, let me give you some basic information. More than a year ago Nokia Sports Tracker has been released as one of Nokia Beta Labs projects. I think the most successful one of all. Why? A client side Symbian application made the magic of sci-fi feature – live or almost-live position tracking, while Web 2.0 service allowed building the community and sharing your digital life with friends. It really ignited! The application was available for more and more devices, giving users more features like: pictures and video geotagging, tracking you player playlist and finally downloading background map. The success of Sports Tracker made it no longer application for the people making sports only. I think that’s why Nokia decided to create a parallel, more official, project called viNe. Unfortunately in comparison to the Tracker, viNe’s tests were closed for normal users. Only some tech-bloggers and telecom journalist were posting some gossips what is the viNe going to be. OK, that’s all about the genesis. Let’s go to the application and service, now available for all interested users. As in case of the Tracker, viNe is both S60 client application and a web page service. To get the application and create an account you need to visit http://web.nseries.com/nseries/vine/. It is a good step forward that viNe allows users to login with general Nokia Account credentials, now giving access to other Nokia products like Ovi, Sports Tracker or Friends View. After the installation application simply asks for credentials and that’s mainly all you need to do! In comparison to the Tracker, viNe seems to have fewer settings available for the users. Unfortunately it also means users need to do some tricks to turn off background map downloading, or other data consuming actions. viNe looks like application rather for data flat users. What does the viNe do? It traces your location in time using GPS module and records all multimedia actions done in the same time. If you take a photo or record a video clip it will be geotagged, located, and then could be uploaded to the Web. If you have music player turned on, it marks the places where you were listening to particular songs. Cool, isn’t it? The most important difference is that when you upload a workout done with viNe it is almost like a one way ticket. Currently viNe web page allows searching for tracks (called viNes) described with specific tags, or type of action: music, photo, or video, but it doesn’t give a way of editing it. If you want to do it, please check your Sports Tracker account at sportstacker.nokia.com. You may be surprised finding your viNe logs there too. There you can edit it, rename it, or take care about photos or videos. Definitely a big advantage of viNe is nice consistent user interface of both phone application and, not so light, web page. Let’s see how will it evolve, and if it will as successful as Sports Tracker already is. 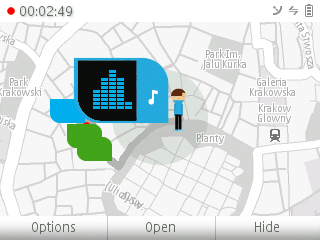 No matter if you can’t live without it, or use it rarely the good news is that Nokia Maps content has been updated. To be sure that digital maps stored on your memory card are up to date I connected my E71 to my PC (via USB, choosing connection type for mass storage) and I activated Nokia Maps Loader. The application checked the card and suggested me updating content for selected areas. Choose countries interesting for you, wait until download of a few megabytes will be completed and.. it is done!